According to DS, no summer holiday is complete without suspension and thrill, which is why a trip to the climbing park is one of the 'must' summer activities. So we went a couple of days ago, armed with a picnic basket and suitable 'sportif' clothing, ready to tackle some of the 22 courses installed in the tree tops of tall pine trees. 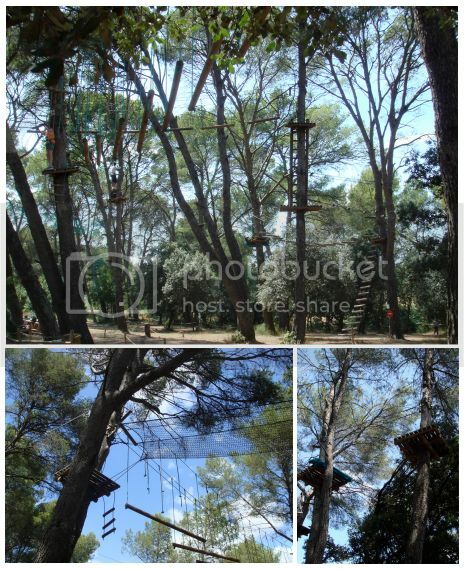 Following the parcours, you move from platform to platform, while navigating around various obstacles made of ropes, steel cables and wood. Wearing jeans, T-shirt and Converse sneakers, accessorising with my 'Ciels Byzantins' mousseline Gavroche (which also served as a 'comfort blanket', lol) and black clic bracelet. Good grief Mai Tai! That looks terrifying. Can't believe you did that AND still looked chic. It WAS terrifying, dear Sarah. Thank you for the sweet comment, I can hardly believe myself that I did it! Goodness, you are so brave, I would never do that! I'm just back from a few days in France, it was wonderful. MT, I've said this before, but does your son know he has the coolest Mum in the world? You look adorable! Dearest MaiTai, Thank you for your sweet welcome - summer can certainly be a busy time with activities, trips, guests... And a heartfelt thank you for your very kind and generous words. What bounty of goodies you treat us with - the S/S 2011 update is a feast for the imagination and the knotting cards are an inspiration for more experimentation! These cards and your capsule wardrobe series highlight how truly important good capsule pieces are. You are a terrific, brave sport dear MaiTai - looking positively amazing even while on an obstacle course! And my goodness, you DO deliver - what a spectacular head to toe shot ;-) Seriously though, you are an embodiment of generosity, my dear MaiTai, and you are so sweet in spoiling us with trying to fulfill our wishes and requests. But please don't try too hard, for any shot of you is a privilege to behold. How lovely is your Ciels Byzantins mousseline - the size, the colors, even the 'Ciels' in the title are perfect. I totally share your feelings about 'comfort blankets' - can feel so protected from the elements. The last time I was coerced into something like this, I didn't look anywhere near as chic or poised as you! Wow,now I have seen it all! The chicest at the top of the tall pines and not a worry on your face! You can do it all...next you will be leaping tall buildings with a H shawl as your cape! You are so dear to share this journey with all of us and I am enjoying every bit of it! Now it sounds like it is time for you to take a long,steaming bubble bath and sip a glass of the bubbly! 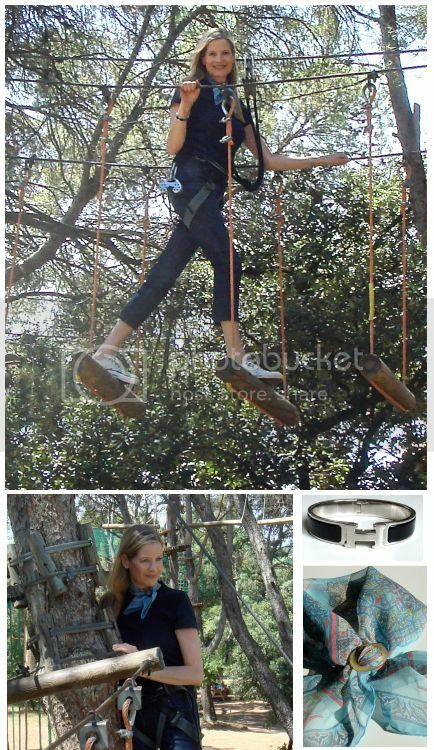 Most certainly the chicest tree climbing mom ever ;-). Looks like you had fun and already looking forward to the canoeing trip, even if it will sans silk - H or no H, your pics are always such a treat! Oh my - that looks FUN! And you look so chic. Great minds - I just posted a pic of me zip-lining in Alaska wearing my TB shawl! (in chat and the action thread)You look 1000% better doing it - and sans helmet! Your son must be so proud of his gorgeous and adventurous mom! Wow, what a fabulous outing! I trust you planned for lunch AFTER these activities LOL! I know I would need to. Rest assured, your fear is not visible. Instead, you look, as always, that you have it "all together"! Well, I guess this just goes to show that beauty and great H. accessories look wonderful anywhere - even dangling from trees. I have to admit that it kind of looks like fun, though - kind of. How cute. Looks like fun, and you still look chic, even in the middle of the forest. Just when I thought I had seen it all, here comes Jungle Jane sporting Hermes. MaiTai, you are a goddess! I am totally speechless at these photos (and a wee bit envious that you and your DS were out having so much fun). You are one super cool Mom. Love it! Not just classy but also brave! BTW, this is my first comment here. I've been an avid reader of your blog since a year now and also sport your furry scarf. I surprised my mom with one this winter and she was (is) very pleased. I love your style, but have to admit that I will never come close to your level of ease and stylishness. But that's OK, life is wonderful and it is too short to mope about baby boogers on my H-scarfs. MaiTai, you look great! What a thrill is must have been to move about the treetops w/ DS. And once again you've proven H makes every adventure that much more fun and beautiful. Amazing, you did that and still looked chic! We have something called Go Wild near us, I suppose I will have to do that one day with my boys. I have mentioned you in my bloggie again, i tried a shift dress in a shop in an attempt to look like you in your fab dress; also thought of you last night, I was going out and wanted to tie my scarf like you have shown in your tutorials - you know they do cooking step by step for Nintendo DS; you should do the same, scarf tying step by step, so handy on a DS, Bx P.S.Can I have half profits, then I can buy a Hermes scarf!!! Aww, at nine years old, DS really does think that way, dear Joanne. Sweet pre adolescence times! Hello Chocolate, Cookies and Candies, be assured that the poised look disappeared quite quickly..the next course was a red run, lol! Aww Trudye, leaping from tall buildings with a H shawl as cape would make DS’s wildest dreams come true! Instead, I followed your sound advice and took a bath and a sip of bubbly, heaven! Tehe, you know DS too well, my dear DD!! While I was completely knackered afterwards, he seemed to have mearly warmed up..
Hi, dear Sheila, great to see you here! Zip-lining sounds more fun than climbing, and Alaska less hot than the South of France.. off to check your pics, already thinking of changing the venue for next year ;-) PS. re the helmet, they don't even have them here! Dear Maisie, lunch was picnic ‘sur place’ and afterwards we tackled another few rounds. Summer holidays come with quite a drastic change from my normal routine! ‘Go wild’, dear Blighty! I thought you looked fabulous in the black little number, but also loved the red long jacket that came home with you. Don’t tell me that boys one and two have cookery courses on their DS, I am so envious!